Movie studios pour so much money into their films that nowadays if a movie puts up $10m or less that’s considered ‘cheap’. Crazy huh? Good lord the things I would do with 10mill though…(pounds not dollars of course, more bang for my buck). But I digress, I think that in this millennial age, movies are trying bold and innovative ways to grab people’s attention and persuade them to get on the hype bandwagon. And with all the money they pour into production, salaries, special effects, locations etc, of course they can afford to make a splash when it comes to advertising. Especially when everything is so interactive, viral and digitised that sometimes a print or TV advert isn’t enough. Case in point, only the other day Air Nippon tweeted this…. How EPIC is this? I mean, aircraft decals isn’t new, Hello Kitty anyone? And also this week we’ve seen Marvel on the promo stroll with their summer flick Ant-Man and their clever guerrilla marketing tactics. So let’s have a look at what movie studios have done to enhance the moviegoer’s experience. Because according to Mashable, this year is about about experiential design. Let’s have a look at some notable movies and their viral marketing magic. I’ve also thrown in what these movies’ total box office gross results, courtesy of Box Office Mojo. Remakes are highly overrated, everyone is doing them! Few are good (or better), many are bad. But with the remake of Carrie, they decided to throw a pissed off, ‘mentally gifted’ girl into a coffee shop in NYC. Chaos ensures. However Carrie ultimately brought in only $84,790,678 and doesn’t rank on the all-time worldwide list as it was limited to the US only. 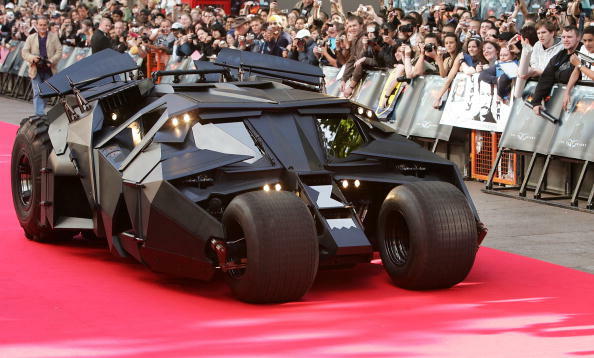 Not only did Warner Brothers bring out the beast above for its European Red Carpet debut in 2008, but the film also had a viral campaign with pro Harvey Dent videos, websites and paper material. Not to mention the various food endorsements, character based websites, scavenger hunts and even a ‘The Gotham Times’ newspaper circulation. Bruce Wayne brought in a earth-shattering $1,084,439,099 and owns the no. 12 spot on the all-time worldwide release list. The prequel came out way, WAY back in 2001 and the sequel came out around in 2013. 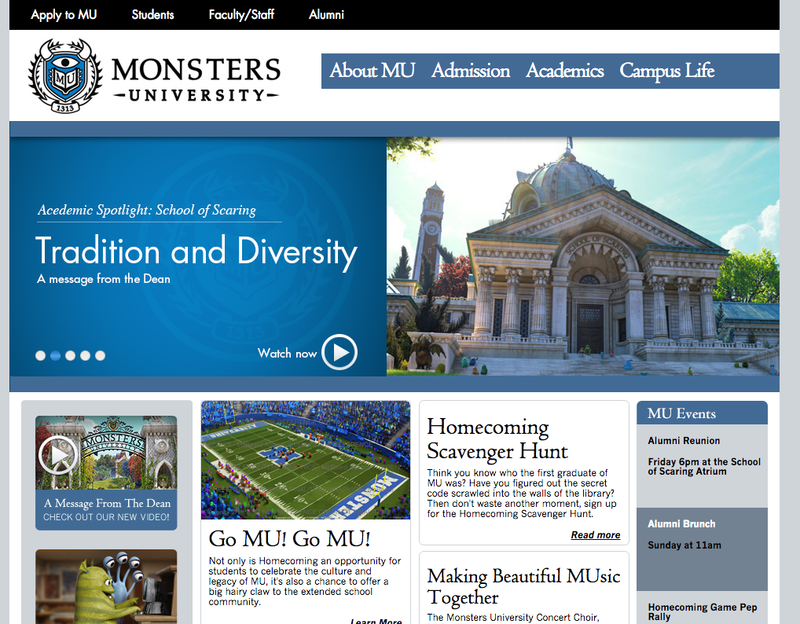 To help promote the film’s premise they launched a Monster University website. Again taping into the growing power of internet presence and social networking, they continued to pump content and info via social networking sites as well as the MU site. The film grossed a big, grand total of $743,559,607, while it currently sits at no. 63 on the all-time worldwide list. If you haven’t seen Borat you’re missing out (or have high movie standards). Either way Sacha Baron Cohen’s character came out from the screen and into our world 8 years ago. Going along the American news circuit in full Borat garb, Cohan brought the funnies and awks to these interviews. Fox News even interviewed him. Good Lord. The film raked in $261,572,744 and sits at no.420 on the all time worldwide list. Ohhh I remember this! Now this was bold! This was a fantastic piece of marketing promoted the anti-superhero film Chronicle. 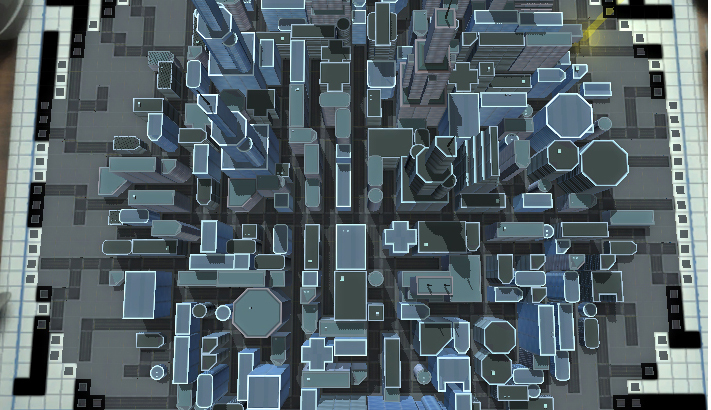 Having people fly above the NYC skyline is just something surreal. Like being a part of the actual film itself. And that’s how you get people hyped and excited about the film, it’s all about experience. It adds another dimension to the whole integrated campaign that blurs the lines of reality and fantasy. Love it! Not bad for a film with a $12mill budget. It churned out $126,636,097 (wasn’t released worldwide, just in the States). The Simpsons have been around for an age (checks IMBD) since 1989….wait, how is it still on the air?! 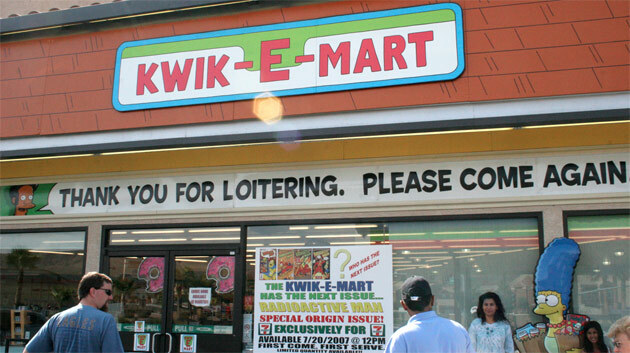 Anyways the film came out 2007 and they created real-life Kwik-E-Mart to get people excited for the film. They basically turned several 7Elevens up and down the USA and kitted them out to look like the Kwik-E-Mart. Even noted Simpsons products appeared in real life, in the form of Buzz Cola Squishees and pink-frosted donuts (plus more). No idea how well it worked but people seemed to have enjoyed it so I’m sure it must have some benefit. The integrated campaign also included custom Simpson-fied avatars and a digitised Springfield exploration site. The film made $527,071,022 in total, ranking at no.127 on the all-time worldwide roster. The foul-mouthed teddy bear that charmed the world had become quite a merchandise icon. You can find actual talking teddies of the rude bear in various shops. Plus leading up to the film, Ted had various social media accounts. Including Facebook, Twitter & Youtube. He also has a blog which was regularly updated and had millions of fans (FB has over 21 million fans if I’m reading that correctly?) He even has his own e-cards in the form of Ted-Cards. 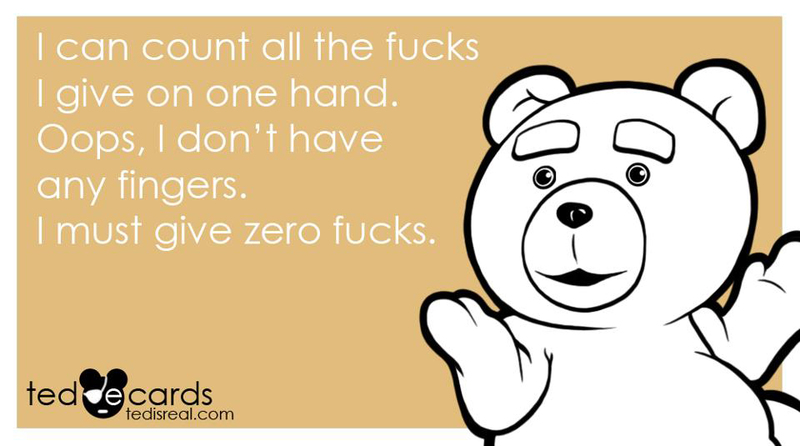 And they are genius (and slightly NSFW but that’s to be expected, this IS Ted we’re talking about). Ted 2 is coming out in this Summer so expect way more social media mischief from everyone’s favourite brash bear. The cheeky sod made $549,368,315 in total gross, ranking 116 on the all-time worldwide list. Another amazing film with a mind-bending concept and storyline. The film’s marketing team brought us the ‘Mind Crime‘, which allows users to delve into the realm of Inception. Plus they also had QR codes, scavenger hunts, interactive websites and even “real” dream scientists. Cool! They also went as far to create a graphic novel as a prequel to the movie storyline. And created a ‘classified’ 24 page document to WIRED mag to stir hype. Box office total gross was $825,532,764. It currently ranks 43 on the worldwide all time list. The YA movie based on Suzanne Collins’ book created all kinds of fun, interactive worlds that the studio’s marketing team brought to life. You had the Capitol website (upgraded to coincide with the second, third and final film instalments) and numerous social media accounts. 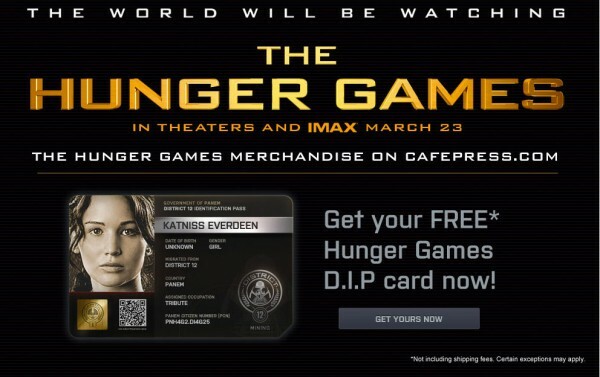 As well as the usual posters and TV spots, the even had district ID cards of which each person was delegated to a particular region in the land of Panem. I’m sure there’s more, but as you’ll see below, I’ll bring up more about its successor sequels too. The film made $691,247,768 worldwide. Currently ranks no. 75. Never seen it, don’t intend to. But the low budget $60,000 film broke the hell outta the Box Office when it came out way back in the late 90s. Before the internet became mainstream, they had a website that featured the alleged footage of the event online, trying to use the footage to tell their story. This film was insanely debated over internet message boards, questioning the authenticity of the footage. This back and forth went on for weeks on end. Remember this was way back when questionable imagery and footage legitimacy couldn’t be shut down in a couple of minutes by a Reddit, FB or Youtube user. The hype over this film brought in $140,539,099. To put that in perspective, it’s the highest grossing film in terms of ‘found footage’. It ranks no. 447 in the all-time worldwide release grossed list. The film’s bizarre extraterrestrial backdrop had created the opportunity for quite a clever marketing plan. Unveiling first hints of the film by guerilla marketing ‘Humans Only’ artwork across London & NYC on benches and bus stops. These subtly, understated designed posters with bold messages brought people to the interactive D-9.com site. Other interactive, multi-faceted sites included multinationalunited.com, mnuspreadslies.com and mathsfromouterspace.com. Word of mouth gave this film the momentum to make a lasting impression on the general public (people are still talking about it today). Social media sites were filled with lots of rich content based around the film as well as the way the promotion was integrated into typical everyday surroundings, mirroring the same segregated, racist-speciesism overtones that dominated the humans and aliens living in South Africa within the movie’s story. The film made $210,819,611 and ranks at no. 566 on the worldwide all time list. So back to THG franchise and their marketing machine. The first film enjoyed a healthy box office response worldwide and the bar was set high. 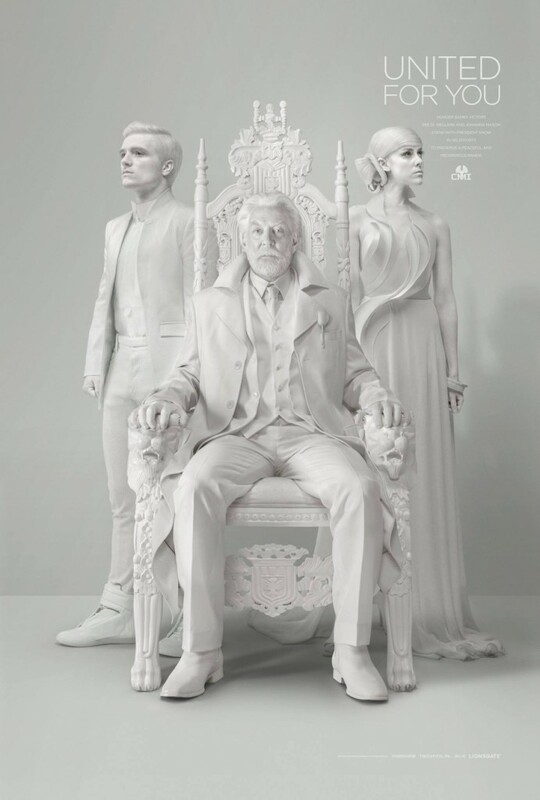 The marketing for the sequel set the bar even higher, with updated interactive sites that included Capitol.pn and the new TheHungerGamesExplorer. They also brought in a lot of Capitol-esque, avant garde meets high fashion marketing, in the form of the incredible Capitol Couture website. The costume designer, Trish Summerville brought our her own Capitol inspired clothing line on Net-A-Porter. Brands jumped onto the HG bandwagon and modelled their products after THG universe and fandom. Those brands included Covergirl, Samsung and even Subway. Ironically a lot of the critics and fandom believed such branded luxuries and obsessions where what the books spoke out against. It’s like living in the actual HG universe, where the marketing is geared at us, very much like the Capitol themselves when the Games would advertise to them about the annual event. Eerie! Talk about art imitating life. There was even a victory tour that took some of stars of the sequel to different spots in the US, including Houston, New Jersey, Miami and Minneapolis. And the tour extended to all the cast who had numerous red carpet premiere events including LA, London, Berlin, Madrid, Rome and Paris. The film brought in $864,912,963 and resides at no. 39 all time worldwide release list. Gosh remember this film? I actually only watched it once, never felt the need to watch it again. But my word, what a bizarre thriller! The film did a good job of advertising itself to be anything but a motion picture. Through forged websites like www.1-18-08.com and documented videos, for the longest time people were divided whether the footage and websites were based on fact or fiction. (Blair Witch anyone?). Filmed in a similar style of Blair Witch in a POV format, its was quite the eerie experience. There were no big names attached the the film and the main plot-line was kept under wraps for months. Only ‘leaked’ footage and rogue websites gave the public a glimpse of what to expect. Again its about that consumer experience, making people a part of the movie’s world as if we’re too a part of it. No just viewers but participants also. Plus the poster with the Statue of Liberty’s head ripped off and NYC in flames was clever. No other info except the date was provided on the poster. Also this film was famed TV director JJ Abrams’ first Hollywood film. The film made $170,764,026, there’s no all time worldwide record of this film but in 2008 it was at no. 36 for that year. Noticing the pattern? Yeah the HG marketing machine is good, damn good! We’ve had teasers of teasers, in the form of ‘Capitol TV’ spots featuring the cast as their characters. Pro Capitol posters and anti Capitol posters. We’ve even had one of those Capitol TV spots ‘hacked’ by the rebel District 13. The websites were also hacked too, and we saw the release of new Mockingjay related content, through social media, interactive sites and a mobile app. Each side is fighting each other and it’s like being stuck in the middle of the promo onslaught. You can read more on a previous blog post based on the political campaigning that goes on in the film and spills out into our world. The film brought in $752,100,229, while being positioned at no. 59 on the all-time worldwide list. A collection of musings and interesting articles revolving around the world of advertising and design. With the odd bit of nonsense thrown in.